Orangutan means "person of the forest" and this Asian ape is indeed truly arboreal. Recent genetic evidence has led to the reclassification of Bornean and Sumatran orangutans as separate species: Pongo pygmaeus and Pongo abelii respectively. 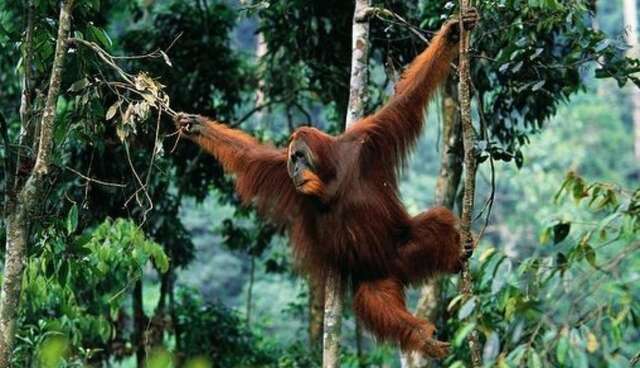 Orangutans have distinctive body shapes with very long arms that may stretch as far as two meters. They have a coarse, shaggy reddish coat and grasping hands and feet. Orangutans are highly sexually dimorphic, with adult males being distinguished by their size, throat pouch and flanges either side of the face, known as cheek pads. To learn more about the Sumatran orangutan and see more rare photos of the critically endangered species, visit ARKive.